Pies de Goma (Rubber Feet) Hay 5 productos. Rubber foot for heavy amplifiers, cabinets, effect pedals, dj's.... With steel insert. Diameter: 20mm. Height: 9mm. Hole diameter: 3,3mm. HIGH QUALITY FROM GERMANY! 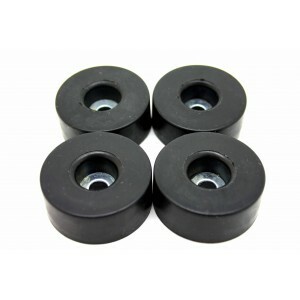 Rubber foot for heavy amplifiers, cabinets, effect pedals, dj's...with steel insert. Diameter: 25mm. 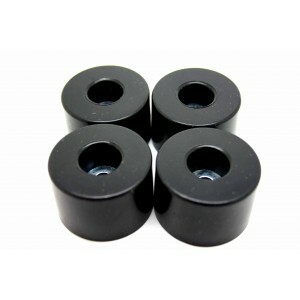 Height: 11mm. Hole diameter: 5,5mm. HIGH QUALITY FROM GERMANY! Rubber foot for heavy amplifiers, cabinets, effect pedals, dj's.... With steel insert. Diameter: 38mm. Height: 15mm. Hole diameter: 6,5mm. HIGH QUALITY FROM GERMANY! Rubber foot for heavy amplifiers, cabinets, effect pedals, dj's.... With steel insert. Diameter: 38mm. Height: 25mm. Hole diameter: 6,5mm. HIGH QUALITY FROM GERMANY!